When either building a new home, moving into an existing home, or simply just re-assessing the safety of a home you have been living in for a while, one of the first checklist items should be checking your residential lock security. 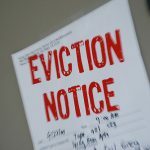 According to the latest FBI statistics, there were 1.5 million burglaries in the United States in 2016, resulting in $3.6 billion in property loss. 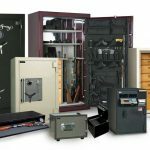 Residential burglaries accounted for 69.5 percent of all burglaries; what these statistics reveal is that home security should be of the utmost importance. The most basic component to residential lock security is making sure to have a deadbolt lock on each exterior door. 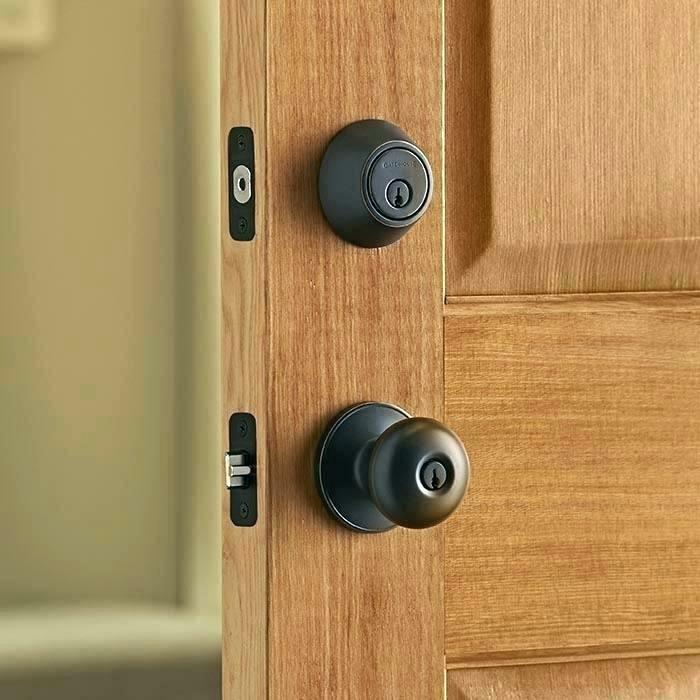 Most front doors on homes found today have a keyed deadbolt as well as a keyed bottom knob, but you will find that this is usually not the case for side, rear, interior garage, or patio doors; alot of these doors may only have a keyed bottom knob. While keyed knobs are technically locks, they are only as strong as their small wedge shaped latches that insert into the door frame, and are easily overcome by forced entry attempts. Whereas a proper deadbolt lock throws a solid bolt into the door frame, essentially making a more sturdy connection between door and surrounding frame, requiring significantly more force to break or pry open. Door knobs are for convenience, deadbolts are for security. 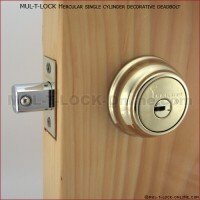 There are two main deadbolt types for residential applications, single-sided and double-sided deadbolts. 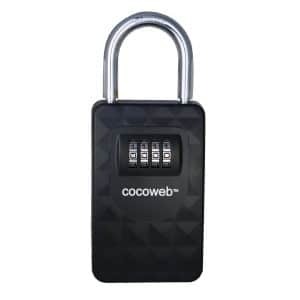 While a recently popular consumer option for deadbolts is to have one equipped with a keypad, this is only a convenience option, and does not improve security in any way; if anything, this opens up the possibility of a burglar obtaining your keypad code, without your knowledge. Single-sided Deadbolts: The most typical deadbolt found on homes, this deadbolt has a keyed exterior lock cylinder, with a thumb-latch on the interior side. Notable examples of high quality single-sided deadbolts include those made by Medeco, and Mul-T-Lock; deadbolts from high security companies such as these two, generally include features such as an ANSI Grade 1 rating, reinforced hardware to prevent pry/ crowbar attacks, longer screws to firmly secure the strike plate into the door frame, anti-drill mounting screws, and anti-pick and bump key cylinders with keys that are not easy to make duplicate copies of. 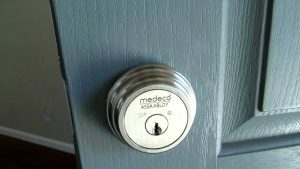 Single-sided deadbolts are perfect for most doors, except those that have glass windows or panes; these doors are susceptible to attack by glass breaking, then reaching inside to unlock the deadbolt via the thumb-latch, which is why double-sided deadbolts should also be taken into consideration. 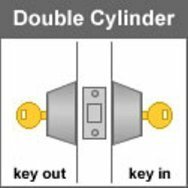 Double-sided Deadbolts: These deadbolts have keyed lock cylinders on both the inside and the outside, requiring a key to lock or unlock the deadbolt from either side. 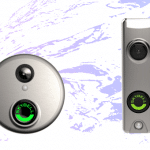 One reason that you might choose this style deadbolt, for example, is if you have any toddlers that you don’t want accidentally reaching up to unlock the deadbolt, and going outside unattended. 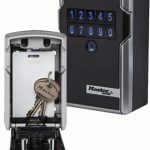 Another inherent feature to double-sided deadbolts are added security for glass pane doors, where a burglar cannot simply break the glass and reach inside to unlock the deadbolt. One concern with double-sided deadbolts, is the fact that you need a key to unlock the deadbolt from the inside; if you or your family need to exit the home quickly, due to fire or another emergency, needing a key to exit adds an extra step that could cost a few seconds time. If you do decide to use double-sided deadbolts as part of your residential lock security measures, it is strongly advised to keep a spare key hidden close by, but out of arms reach from the door. While on the topic of keeping spare keys around the house, our locksmith technicians have seen cases of homeowners hiding keys under welcome mats, or using hide-a-key boxes, such as those shaped like small rocks or lawn sprinklers. 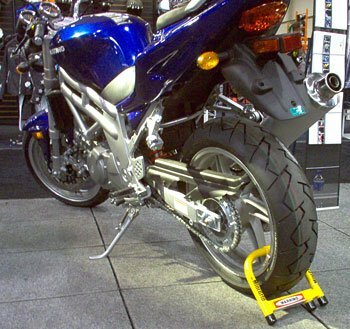 We highly recommend AGAINST using these methods; both professional locksmiths and burglars can see right through these measures. Instead, if you must have an exterior key hiding solution, we suggest adding a lockbox away from plain view, to secure your spare keys; the gas meter on the side of a house is a perfect place to secure a lockbox, away from the front door. Checking and making sure that a deadbolt is installed on every exterior door should be the top consideration on your list for residential lock security measures; this includes garage interior doors, as a potential burglar may be able to gain access past any overhead garage doors.When shopping for new deadbolts, make sure to purchase from a reputable security company, as not all deadbolts are built to the same quality standards, and higher end models can include additional security features, such as anti-drill screws, pick/ bump resistant lock cylinders, and reinforced parts to prevent forced entry attacks. 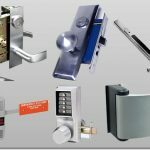 Deciding between single-sided and double-sided deadbolts will depend on the doors of you home, as well as any special needs considerations you may have. 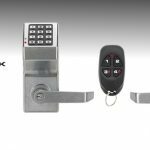 If you would like a free consultation for your home, feel free to Contact Us and let Las Vegas Locksmith – MX Locksmith help you with your residential lock security needs! Thanks for mentioning that you may want to have a key lockbox to hide the key to your deadbolt, rather than placing it under the mat. I have a single parent, and soon my little brother may be the only at home, so we want to keep him safe. I’ll share this article with my dad, so we can find the best deadbolt door lock to protect my brother. Thank you very much for reading and sharing Bethany!